That gave me a pause because I couldn’t quite believe what I was hearing. So I asked: “I completely understand that you might not have remembered some words but what could you have done to help yourself in this situation?” Without any prompting, the student readily identified a number of strategies including: looking up the words in a thesaurus/dictionary, “Googling” them, or even asking an adult to help her with choosing the best answers from a number of choices. My follow-up question to her was: “Why didn’t you?” The student just shrugged her shoulders and looked at me in surprise, as though this concept had never occurred to her. This incident got me thinking regarding the pervasive influence of learned helplessness, and how our students continue to be impacted by it long after they begin receiving the necessary therapies to improve their academic performance. For those of you unfamiliar with this term, here is a brief overview. This phrase was coined by a US based psychologists Martin Seligman and Steven Maier in 1967. In a series of experiments they exposed dogs to electric shocks that they were unable to escape. After a little while the dogs stopped trying to avoid the aversive stimuli because they became conditioned to the fact that they were helpless to change the situation. However, the most fascinating aspect in these series of experiments was the fact that even after the opportunity to escape became clearly available, the animals still failed to take any action and continue to behave as though they were still helpless. How does this apply to students with learning disabilities? Many students with language impairments and learning disabilities struggle significantly in school setting due to failing academic performance. The older they get, the more academic demands are placed on them. This includes but is not limited to the amount of homework they asked to complete, the number of long-term projects they’re expected to write, as well as the number of tests they are expected to study for. Because they are unable to meet the ever increasing academic demands, their parents begin to actively micromanage their academic life by scheduling the times when the students are expected to perform homework, study for tests, do projects, and much much more. As a result, many of the students do not know how to do any of the above activities/tasks independently because they are conditioned by their parents/teachers to tell them what to do, how to do it, and how to lead their academic life at any given moment. The students begin believing they they are helpless to change even the most basic situations (e.g., take an extra step during the homework assignment and look up a vocabulary word without anyone telling them to do it) and continue to behave in this fashion long after they begin receiving the necessary therapies, coaching, or in school assistance. This is especially true of students whose language/learning disabilities are not identified until later in their school career (e.g., late elementary years, middle school, or even high school). 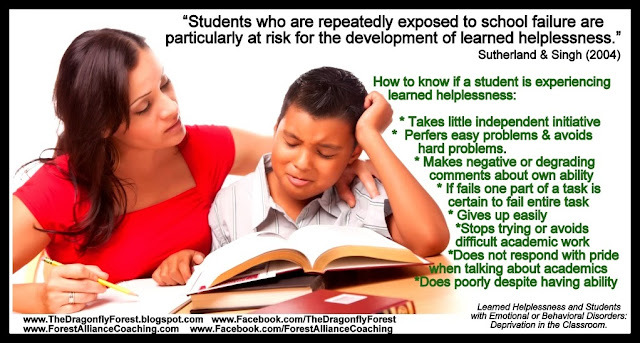 What are the Symptoms of Learned Helplessness in Children? The below poster from Dragonfly Forest Blogspot/Forest Alliance Coaching summarizes it quite nicely. Below are just a few examples of learned helplessness in students with developmental disabilities, which were inadvertently (and/or deliberately) reinforced by the adults in their lives(e.g., family members, educational staff, etc.). According to available literature, when psychologists had tried to change learned helplessness in animal subjects it took them between 30 – 50 times of physically moving the dogs across the barrier before they proceeded to do so independently. Thus, it stands to reason that the process of rewiring the brain in humans with learned helplessness will be a lengthy one as well. The first task on the part of adults is active analysis of all the things we may be doing as parents and educators, which inadvertently reinforces learned helplessness in our children/students. Some things may surprise you. For example, I frequently ask the parents of the students on my caseload what chores and responsibilities they give their children at home. In an overwhelming majority of the cases my clients have very few chores/responsibilities at home. This is especially apparent in families of language impaired children with typically developing siblings. Conversations with parents frequently reveal that many typically developing siblings (who are sometimes younger than my clients) have far greater responsibilities when it comes to chores, assignment completion, etc. While our language impaired children of the same age may not be capable of some of the above responsibilities they are capable of more then we give them credit for given appropriate level of support (strategies vs. doing things for them). It is important to recognize the potential of the children that we work with without letting their disabilities to color our subjective perceptions of what they can and cannot do. In other words, just because there are significant physical/cognitive handicaps, it does not mean that given appropriate accommodations, therapies, resources, as well as compensatory strategies that our student will not be able to reach their optimal potential. While it’s true that many of the children who we work with have significant sensory needs, we can still ensure that the children are engaged appropriately during therapy sessions without displaying challenging/maladaptive behaviors. If the child is displaying challenging behaviors it may be a form of communication. As such rather then accidently reinforcing it get down to the cause of it, to figure out how to replace it by a positive behavior. Keep in mind, kids are still kids! Much like typically developing kids, kids with disabilities can also misbehave, just because they can. This is also very important to tease out and deal with appropriately in order not to mistakenly attribute it to a sensory deficit or communication difficulty. Even in the presence of physical and cognitive disabilities students are still capable of performing a number of tasks and chores. This may include but not be limited to cleaning up own room, making up one bed, loading and unloading the dishwasher, taking out the garbage, vacuuming the floor, pushing the grocery cart in the store, loading and unloading food at the cash register, and much much more. Hobbies improve neuroplasticity of the brain (or the brain’s ability to reorganize itself by forming new neural connections and continue to rewire throughout life). Hobbies is not something that first comes to mind when it comes to children with disabilities but they can be hugely important. I knew a number of children and young adults with developmental disabilities whose hobbies of painting, crafting, and even golfing, actually turned into occupations, when they became older. Hobbies assisted these individuals in becoming more self-sufficient and independent in their pursuits, which is directly what needed to be achieved in order to combat learned helplessness. Similar to hobbies adaptive sports can be incredibly beneficial to children with developmental disabilities. Movement helps to rewire the brain! Adaptive sports participation increases the child’s independence as well as fosters socialization with others. Engagement in adaptive sports can also combat learned helplessness. Unfortunately the quality of life of the children with developmental disabilities that we work with is often compromised. Because there is inordinate focus placed on “just existing” and fitting in all the therapies, frequently joyful experiences are few and far between. If the situation allows it needs to change! There are so many simple activities we take for granted, which can bring true happiness to the children that we work with. Don’t let the child’s cognitive and/or physical limitations stop them from reaching their true potential. Changing the ingrained patterns of learned helplessness is no easy feat. It requires time, perseverance, and patience. But it can be done even in children with significant developmental and learning disabilities. It is a difficult but much needed process, which is instrumental in helping our students/children attain their optimal potential. Seligman, M. E. P. (1975) Helplessness: On Depression, Development, and Death. San Francisco : Freeman. Peterson, C., S. Maier, and M. Seligman. (1993). Learned Helplessness. New York: Oxford University Press.